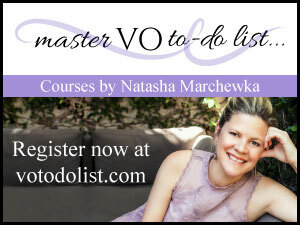 This is a Q&A column on VoiceOverXtra where I answer a veritable smorgasbord of voice over questions. If you'd like to pop a question to me, please see my contact info below. Q: I recently bought the Rode NT1-A microphone and am looking into what mixer / audio interface to buy. I've looked at both the Alesis MultiMix 8 USB 2.0 and the Mackie ProFX8. Also, the Akai EIE Pro was recommended to me. Buyers of most of the mixers I've looked at seemed to have more issues than positive things to say. What is your recommendation? - Colin S., Columbus, OH. A: Re: your mic and mixer question, Colin, I'm not a techie. I know just enough to be dangerous. 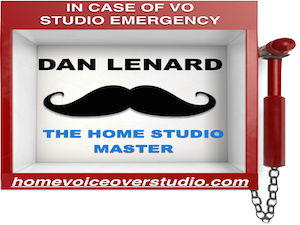 But the man who knows more in his little pinkie than most tech guys know in their whole body is the Home Studio Master, Dan Lenard. He can give you some advice and even help tweak your home studio. 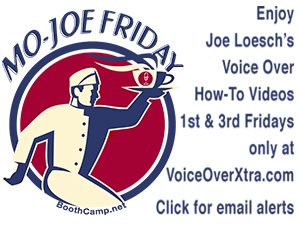 You can reach him at http://homevoiceoverstudio.com. I’ll forward this to him. Break a lip! Hi Colin! My first question would be, "What are you mixing?" Mixers are really for multi-source, live production. Unless you're doing a live broadcast or webcast or something, you have no need to have more than one channel. Mixers "generally" add an analog step to your audio chain, which today isn't a plus. Yes, they have a "pre-amp" in them, but they are usually analog and not of the highest quality unless you buy a fairly expensive unit. There are some mixers with USB, like the Mackie ProFX8 and the Akai EIE Pro. Those aren't really designed for voice work as much as producing music, which is the case with almost all recording stuff we use for voice work. If you're a Mac, the Apogee ONE and DUET are superb. If you're PC, we've been suggesting something fairly inexpensive and easy to set up like the Focusrite Scarlett 2i2 or the PresonusAudioBox. There's a bunch of other ones, as well. When soliciting advice from people on what they use for an digital audio interface, keep in mind that most of the time their experience with interfaces is limited to the one or two they've ever used, as opposed to hearing the plethora of options out there, in other people's studios, where the rubber actually meets the road. The only real difference between moderately priced gear and the real expensive stuff is longevity and reliability. Yes, there are some frequency response differences, but not anything anyone would truly notice with single track mono voice tracks. So to sum up: You don't need a mixer. You need a good digital interface with one or two channels, just in case you need to use two mics at the same time, in which case you can "mix" them from the interface. Dan, thank you for the advice. As you may have guessed, I’m new to pro audio equipment. To answer your question about "What I'd be mixing," the answer is: myself. I was using a Blue Snowball and was / am upgrading my mini studio (which consists of mic + laptop). I got the Rode NT1-A, as per my previous email and recently had reconsidered the need for a mixer and am considering the CEntrance MicPort Pro as an option. The Akai EIE Pro was recommended to me by some folks at a Guitar Center, but I learned awhile back (through my time as a computer tech) to never trust a store employee when they recommend stuff. Previously I was told the Alesis MultiMix 8 USB 2.0 might be an option, but in fairness (and my own naïveté) the person that recommended using a mixer is waist-deep in pro voice work and potentially has a phone patch (which I know you can do with a mixer per internet searching). The Mackie ProFX8 was on my "list" of possibilities, however, when I see reviews like the ones I was reading on Amazon.com it makes one a little apprehensive. Given my "newbie" status per audio hardware, can you please tell me what the difference is between the Akai EIE Pro and the Focusrite Scarlett 2i2 /Presonus AudioBox? Also, would it be better to use something like the Focusrite Scarlett 2i2 vs. the CEntrance MicPort Pro? Colin, don't be intimidated by technology. It’s all like plugging in a stereo (only no left and right). Don't over-think things like phone patches. Cross that bridge when you come to it, and with today’s technology, you may never have to. Phone patches are 60's and 70's technology. Focusrite makes excellent pre-amps, and that in combination with an outstanding digital interface gives you great versatility. Plug it in, set the level and forget about it. The Mic Port Pro is really a road tool, and it’s important to note that with Rode mics, which are outstanding, but have lower average output, the Mic Port Pro doesn't have enough gain. The 2i2, which is the same price and probably just as portable, is a better choice for you. 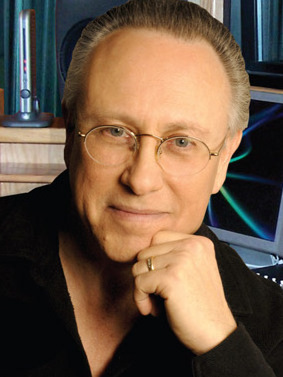 Marc Cashman creates and produces copy and music advertising for radio and television. 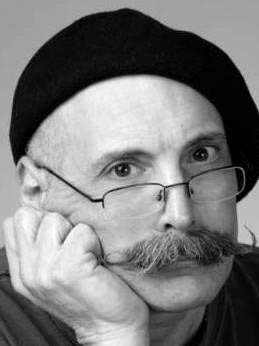 Winner of over 150 advertising awards, he also instructs voice acting of all levels through his classes, The Cashman Cache of Voice-Acting Techniques in Los Angeles. I agree with Dan: We encourage clients to listen in via phone patch and, while some may say "old school" I say professional if the client actually CARES about the end product and wants to "get it right" the first time" without a lot of re-take hassles. A phone patch (or Skype) is a goal to shoot for quickly. Hey Colin, I agree with Dan. Although I'm not the tech wiz Dan is, we both come from the "old school" and have used a lot of gear over the years. He's right, you don't need a mixer for simple VO set up. Also, I have a Focusrite Scarlett 2i2 I bought when they first came out. They're very clean (Focusrite is known for their great pre amps), all metal chassis and faceplate, solid pods and great construction. And only about $150.00. Set it and forget it! If you are only recording yourself, then you probably don't need a mixer. But until ISDN is truly gone and clients also adopt methods allowing them to offer live direction that don't include a telephone... going without a mixer is very limiting. Eventually, the day will come when all of this can be done on one computer and everyone (clients included) will be comfortable with that workflow. However, that day is not here yet. The voice talent who wants to be prepared for any possibility... should consider incorporating a mixer into their setup. Just my $.02 FWIW.